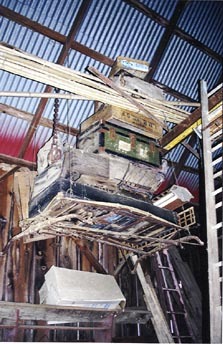 Hanging from the rafters of an aging barn on historical Crook-Grey ranch one Crosby-Herold road was an old one horse buggy. On February 20th seven members of the Lincoln Native Sons of Golden West descended on the ranch to rescue the vehicle. Most recently the ranch had been own by Austin and Hope Grey. It was settled in the last century by Austin Grey great-grandfather Austin B. Crook. 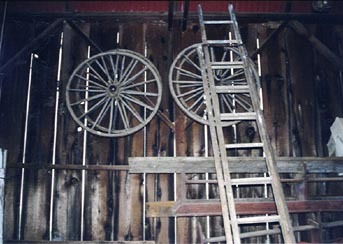 Left Wheels hanging on the barn wall. 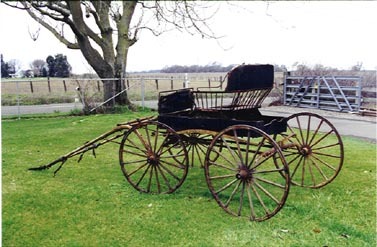 The buggy, stored for years in the barn, belonging to Oliver Grey of Lincoln. Who had purchased it about 60 years ago from Jacob Miller in Lincoln. It was Oliver Grey who donated the buggy to the Native Sons, who will restore it and use it in parades and historical exhibits. Right Hung from the barn wall, the buggy became storage place for all sorts of treasures. The pioneer Austin Crook family, originally from New Hampshire, arrived in western Placer County in 1884, settled the ranch by 1888 and planted grapes and currants. Their A.B. Crook store was popular in Lincoln from 1889 until 1917 and was located about what is now 509 G. Street. Left Member gently lower buggy from it's home for so many years. Austin Crook's granddaughter, Mildred Crook married Edward Grey. Their children include Austin, Betty, Edward Jr., Frances M., Jane, Lucy, Ann, Marcia, and Oliver, all of whom grew up in Lincoln and attended local schools. Grey family members have been prominent in Lincoln business and civic affairs for more than a 110 years. Right The assembled buggy waiting for some tender loving care to bring it back to mint condition. 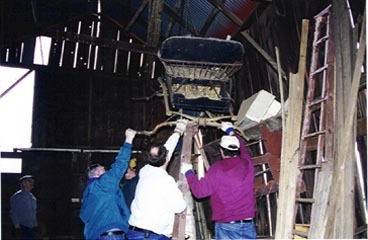 If you would like to help us restore this buggy, why not join the Native Sons.